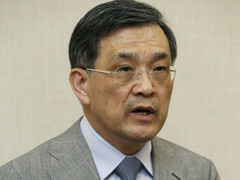 Samsung CEO resigns amid "unprecedented crisis"
One of Samsung's three CEO's has announced his resignation from the South Korean giant. Citing the "unprecedented crisis" facing the company, Kwon Oh-hyun, CEO of Samsung Electronics and Samsung Display will step down in March 2018. It is something I had been thinking long and hard about for quite some time. It has not been an easy decision, but I feel I can no longer put it off. As we are confronted with unprecedented crisis inside out, I believe that time has now come for the company start anew, with a new spirit and young leadership to better respond to challenges arising from the rapidly changing IT industry. The company needs a new leader more than ever and it is time for me to move to the next chapter of my life. The crisis that Kwon refers to is not the current financial state of the operations that he oversees, which includes its very successful components business, mobile display business and its leading range of Android devices. In fact, the company announced that it is headed for its second straight quarter of record profits on the back of booming sales, which includes the supply of the AMOLED displays that Apple is fitting to its iPhone X. Instead, Kwon is in all likelihood to be referring to the scandals that have rocked Samsung’s wider leadership to the core. Its troubles started when the heir and de facto leader of the chaebol Lee Jae-yong was found guilty and imprisoned for bribing South Korean government officials in order to give the company favored treatment. With Lee jailed in August for a period of five years, and now Kwon resigning, it is quite possible that other two CEOs in Samsung’s chaebol may also put arm’s length between themselves and the company. Perhaps for their own sake or for the sake of the company. > Notebook / Laptop Reviews and News > News > News Archive > Newsarchive 2017 10 > Samsung CEO resigns amid "unprecedented crisis"
I have been tech-obsessed from the time my father introduced me to my first computer, an Apple ][. Since then, I have been particularly interested in all things Apple, but also enjoy exploring and experimenting with any computing platform that I can get my hands on – I am the definitive early adopter! I have always been interested in how we can use technology to shape and improve our lives, most recently using it to record, mix and master my debut record, Acuity – Nature | Nurture.